Due to the new Alphacool D-RAM modules all memory blocks can easily and quickly be equipped with water coolers! 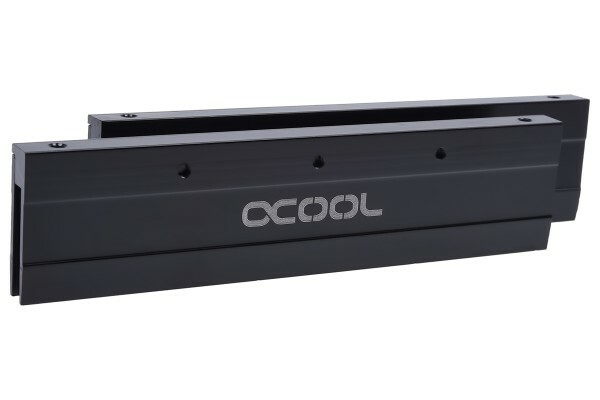 A fight against the underrated heat source "memory" has been announced with the new system of the Alphacool D-RAM coolers . With these modules, the memory blocks are clamped in the modules (with the attached thermal pads) to achieve optimum cooling results . The seperately available D-RAM coolers are added and screwed in at the required siz after successfull assembly. We recommend a very thin layer of thermal paste applied between module and cooler for an optimal heat transfer. A thicker thermal pad must be used on one side for single-sided memory blocks which is not included and has to be bought seperately.